“For most of the wild things on earth the future must depend upon the conscience of mankind.” The late Dr. Archie Carr, a scientist and author who almost singlehandedly began to turn the tide on the extinction of sea turtles. There are no words to describe the incredible majesty of nature when we witness a sea turtle instinctively emerge onto the shore of our beach and purposely make her way towards our property to find a nesting spot for her eggs. She is focused and drawn by her memory as she has been here before. Most sea turtles return to the same spot where they were hatchlings 20 to 30 years earlier. Scientists call this imprinting. On May 13, 2011 our beach was visited by a Leatherback Turtle who required the assistance of the Florida Fish and Wildlife Conservation Rescue team to maneuver it back into the ocean after she laid her eggs. The rescue was humbling and reminded us of the importance of our role in protecting these endangered sea turtles. Each year thousands of sea turtles journey to Palm Beach County, making it the second largest sea turtle nesting area in the United States. The largest is at the Archie Carr National Wildlife Refuge in Brevard County, FL. Singer Island is an important high-density nesting beach for sea turtles, including loggerheads, green and leatherbacks. It has been estimated that approximately 57,789 loggerhead, 16,638 green turtle, and 500 leatherback hatchlings could be expected to enter the water annually along Singer Island. Nesting on our beaches begins as early as March. Early nesters are usually leatherbacks with the more numerous loggerheads arriving in significant numbers in May. Nesting continues into August and tapers off in early September. The female sea turtle crawls ashore at night to dig a nest, deposit her eggs, cover the nest and return to the water. While on the beach, sea turtles are timid and vulnerable and can be easily frightened away if disturbed. It takes between one to three hours for the female turtle to lay her approximately 110 ping pong ball-sized eggs. Each sea turtle species plays a unique and critical role in sustaining the health of different marine and coastal habitats. For example, where healthy numbers of green turtles graze on sea grass, species such as shrimp, lobster, fish, and sharks thrive because the grasses are healthier and more productive. 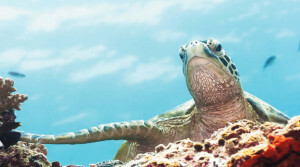 The decline of sea turtle populations has serious implications for countless marine animals as well as our own species. In short, sea turtles are an important strand in the web of ocean life. Sea turtles help to sustain the oceans, and the oceans sustain life on the planet. Whether sea turtles vanish from the planet, or whether they remain a wild and thriving part of the natural world, will speak volumes about both the general health of the planet and mankind’s ability to coexist in a sustainable manner with the diversity of life on Earth. The Ritz-Carlton Residences, Singer Island has the distinct opportunity to set an example as an active supporter of sea turtle protection. Our commitment will include the completion of property changes as indicated by the local and state ordinances as well as the increased awareness of visitors and residents about the vital role that sea turtles play in the environment. We hope that our actions will inspire other community members to participate in this important environmental initiative. Do not walk on the beach with a flashlight or shine lights at sea turtles. The light can cause females to abandon the nesting process and discourage other turtles from coming ashore to nest. Avoid going to the beach to observe turtles at night without a permit. light can be even more disturbing than flashlights. Turn off outside patio lights and shield indoor lights from shining directly onto the beach by closing the drapes at night. Lights disturb nesting sea turtles and disorient hatchlings. Level all sandcastles and fill any holes dug during play. These are fine during the day but may pose additional hazards at night. Leave the beach as you found it, so that sea turtles and hatchlings are not hindered on their way to nest or to the water. Be careful when digging on the beach. Most sea turtle eggs are deposited 18 inches below the surface of the sand above the high tide line. To avoid disturbing sea turtle nests, please dig holes and sandcastles below the high tide line and place umbrellas with care. Dispose of trash when you leave. Sea turtles mistakenly eat debris, especially plastic, which results in death. When crossing a dune, please use designated cross overs and walk ways. Do not climb over the dunes or disturb dune vegetation. Remove beach furniture as it can be an entanglement hazard for nesting sea turtles and can block access to the nesting beach. County regulations require that all beach furniture, boats, and similar items be removed from the beach at night or stored at the toe of the dune. Stay out of the sea turtle’s way. Don’t put your hands on or near the turtle. Any distractions may frighten or disorient them, causing a female to return to the ocean before finishing her nest, or misdirecting a hatchling away from the water. If you see an injured or dead sea turtle or if you see someone disturbing a nest or turtle, call the Florida Fish and Wildlife Conservation Commission 1.888.404.FWCC (9322) or *FWC from your cell phone.